Ministry of Steel has agreed to the proposal received from various CPSEs under its control to introduce the pension scheme with effect from 1st January 2007 in case of executives and 1st January 2012 in case of non-executives or from a subsequent date as decided by the company. The agreement was reached after detailed consultation with representatives of employees unions and officers associations belonging to SAIL, RINL, MSTC, FSNL, MECON and KIOCL. 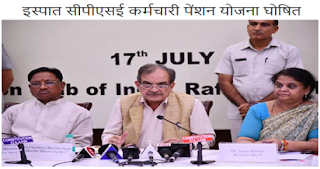 This was announced by the Union Minister of Steel, Chaudhary Birender Singh in New Delhi today.